that looks like serious loft! Seriously: yes it came out of the box and just kept growing but then there's a whole 500g more down than in my Quantum 200. 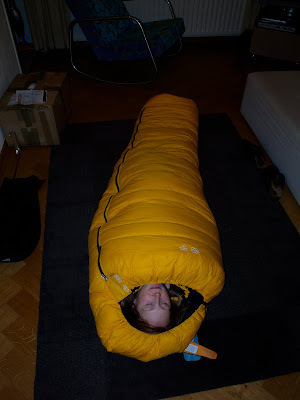 I'd forgotten sleeping bags could look like this. The quality and feel are what you'd expect from Cumulus and that instils confidence. I'm happy I took the plunge. That bag looks seriously warm and you'll be fine sleeping in that, as long as your mat is up to it. The new stove looks good. If the temperature really dives you can always turn the cannister upside down for a liquid feed. Coordinates with my inner tent too which is also a warm yellow. Doesn't mean much to me but it will make my wife very happy. Pleurisy's the thing. Makes you feel bloody marvelous as you shed the pounds. That, or maybe, tapeworms? I hope your tent is roomy enough for the bag, or did you buy another yellow tent as well? Enjoy the trip, looking forward to the photos. Alan, Tapeworms. Now there's an idea. Suspect that any benefit might be offset by teh need to carry extra rations though. Woohoo, I love the colour! Yellow is the trend colour of 2010 - I got a yellow tarp, bivy and mat, so I am all kitted out! Yeah, now you qualify for Team Mellow Yellow! Roger, Hendrik and I are trying to brighten up the wilderness in 2010! Aah. One catch. Only my inner tent is yellow. The outer is green. Not a funky green either. Just boring old low impact green green. Very nice and you are spot on about that kit needs to allow max loft. High loft = warm nights. It would even fit me at 6'2. Martin, yes I hope the equation holds. The prime bags are indeed just a litle longer than the quantum series so would suit a 6'2" er like yourself. ptb, welcome! No I hadn't. I realise they used polish goose down but I'd assumed Cumulus was an English brand. Very nice products!